If you think that search & rescue is confined to the sea or mountainous areas, then you are mistaken. Every year thousands of people is reported missing in Essex, as they are in all counties throughout the UK. In the majority of cases they turn up safe and well – but sometimes they don't. If the missing person is one of your loved ones, you will expect well-equipped, well-trained search and rescue professionals to bring them home safely to you. ESAR is a registered charity and is funded entirely through voluntary donations and contributions. As well as funding the training of searchers and search management capability, donations also pay for all the equipment needed for the team to be fully self-sufficient in their role, such as an control vehicle, mapping, GPS, communications and first aid equipment, etc. ESAR is one of many Lowland Search and Rescue units that exist countrywide. 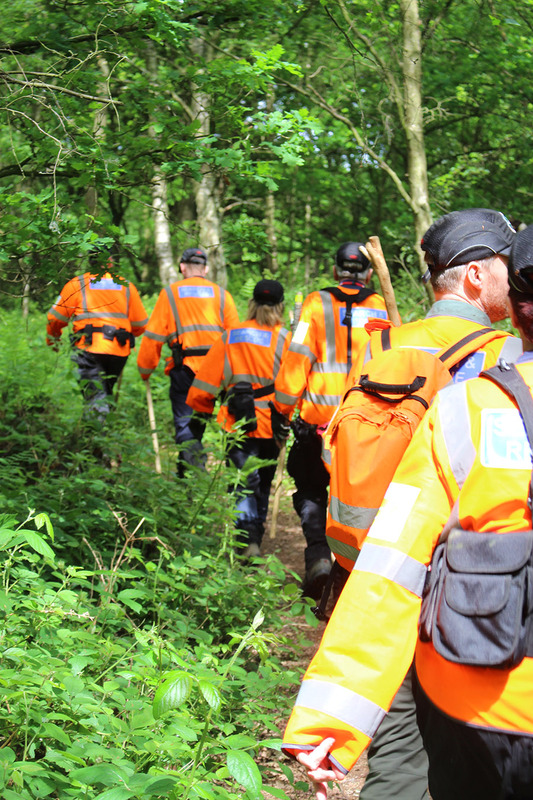 Like our sister organisations we are affiliated to the Association of Lowland Search and Rescue (ALSAR) who are responsible for co-ordinating the various groups and setting the standards to which we must adhere. Currently there we have 55 operational members, with 50 members on call 24/7. We have 3 people in the Support Team, but are hoping to attract more volunteers who would like to be involved in a non-operational aspect. We also have 8 new recruits or probationers who are currently being trained in the skills of being a Search Technician. We would like to attract new members and feel that contacting you would enable ESAR to reach a more varied and wider audience and help us raise our visibility to ensure we stop being "Essex Best Kept Secret". If you would like to ESAR we have a website and an amazon wish list available for people to purchase important items to keep us going. I received a standby text from Search Management....my first potential live call out. I’m beginning to buzz along with some apprehension. At this point I’m thinking, “right, am I prepared?” I know I have all my kit with me, but I still go and check. All is there, kit all ready, torches charged and spare batteries in abundance! On the way I had numerous things running through my head, things like, what or who we would be searching for... what type of search we would be doing...., along with keeping safety in mind due to weather conditions - dull, overcast, very fine rain and cold! On arrival at the Rendezvous Point (RVP), some of our search team were already on site along with a number of police colleagues and cars. At this point I had a feeling of wellbeing and honoured to be part of such an amazing life saving charity! Reality had really kicked in!!! We were tasked to relocate to a different RVP approximately 10 minutes away. On arrival we set up the incident control vehicle.... communications antenna and repeater antenna, started the generator, turning on computers, defining search areas, printing off maps, and allocation of resources. Once kitted up, we were called to gather for the search briefing and put into teams. We were given our team’s search area, this required a short drive to the start destination. Once at the destination we checked the map again. The area was a large woodland. We still had approx 1 hour of daylight left so decided to carry out a line search across the shortest part of the wood to make sure the area was covered thoroughly. We used fluorescent ribbon markers to mark the end of our line search to ensure we were on track and covered every part. The woodland was fairly dense in areas with an occasional ‘pill box’ with partially bricked entrances, these were checked to ensure the MISPER was not inside. There were 4 searchers and 1 Police Officer on our team. We spaced out at 5 metre intervals, giving us a search line of approx 20 meters. I decide to take responsibility of the Police Officer with regards to advising him on what to do and how I wanted him to search. The Police are trained in different search techniques to us plus this was the Officers first day as a Probationer! We carried out 3 line searches with no signs of the MISPER. On our 4th line search, approx half way through, I heard what sounded like “Help”, but couldn’t be sure. It came from ahead to the right, which would have been on our 5th line search area. I indicated to the team to hold the line and keep silent, then, we heard another call, this time it was definitely “Help”. We quickly headed to the area from the call. I was the first aider in my team, carrying the medic bag. I then saw a person on their knees just on the outside of the woodland. Being the first aider, I attended the MISPER and found they matched the description given to us at the briefing. The MISPER was extremely cold, very wet and hypothermic, and, at this point, could barely talk and was shaking and shivering. I introduced myself to the MISPER and told them we were there to help them and kept reassuring them. I called in my team members to give assistance. We quickly put a coat on the MISPER and wrapped them in the blanket from the medic bag to keep them dry and try to warm them up. Another member of the team put a coat of them and hugged them to keep them warm. I asked the MISPER if they had any injuries to which they shook their head, “no”. I put a pair of search gloves on their hands and one of the search team continued to hold the man to warm them up. At this point radio communication to the control van failed, so I used my mobile phone to call the Search Manager in the incident control vehicle, telling him the MISPER had been found, giving a description of their condition, along with the grid reference position and that medical assistance was required immediately. I then filled in the Patient Reporting Form and kept regular updates of the MISPER’s condition. As we were quite some distance from assistance, we gradually warmed the MISPER enough to gain some verbal information from them, which enabled them to confirm their name, being that of the missing person. Help arrived and the MISPER was taken to hospital for further medical assistance. I, and, I’m sure the whole team felt extremely proud – we had saved a life! That feeling will never be forgotten. The training we had been given during the previous 5 months had 100% prepared me for the professional search technique, medical procedures and assistance to give. 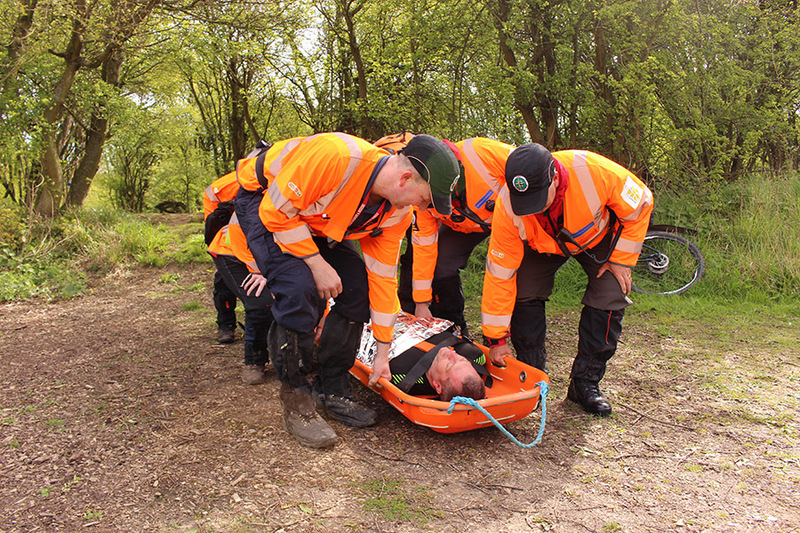 Ongoing training is a must, without this training we would not be able to carry out the life saving work we do. Mark.....my first ever live search! No search too small, no journey too far, no piece of kit un-purchased!